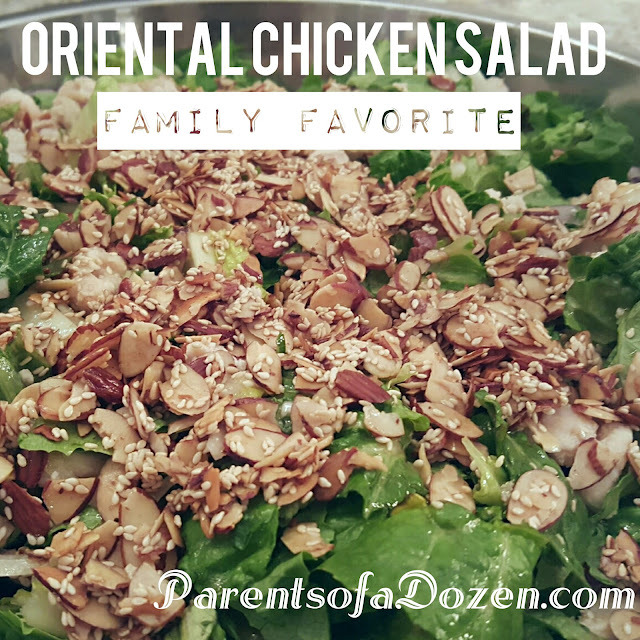 Parents of a Dozen: The Best Oriental Chicken Salad Ever! Cut up boneless breast of chicken and then cook it or you can can cook a chicken and then remove it from the bones. 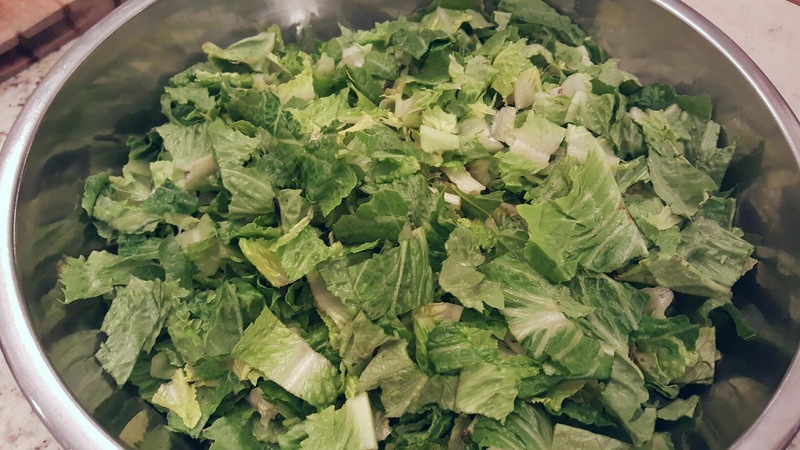 Cut up romaine lettuce and clean it in a salad spinner. 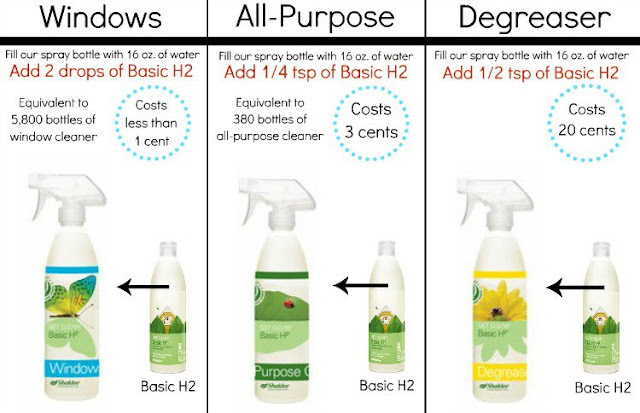 I like to use my favorite natural Cleaner, Basic H2, to clean all vegetables and fruit. 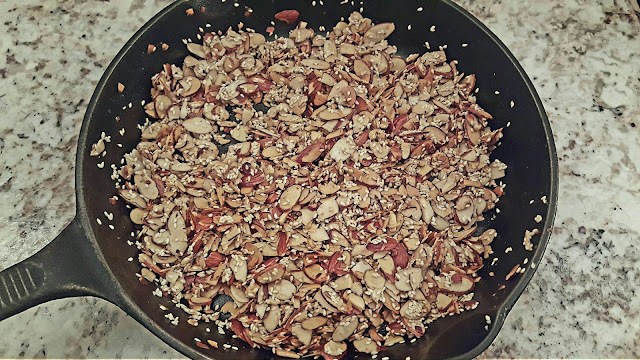 I melt the butter in a pan on low to medium heat and then stir in the almonds until they start to get golden, then I add the sesame seeds for another minute. These are the ingredients I use to make the dressing. The recipe calls for sugar but I decided to try this pure birch sugar. I usually use in organic sugar. 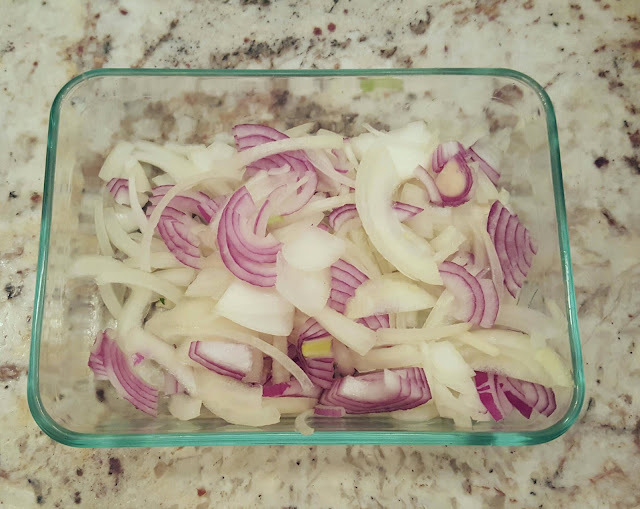 I cut up the rest of the onion it was in the refrigerator and added a small red onion. This is in place of what the recipe calls for which is green onions. I didn't have any green onions on hand. 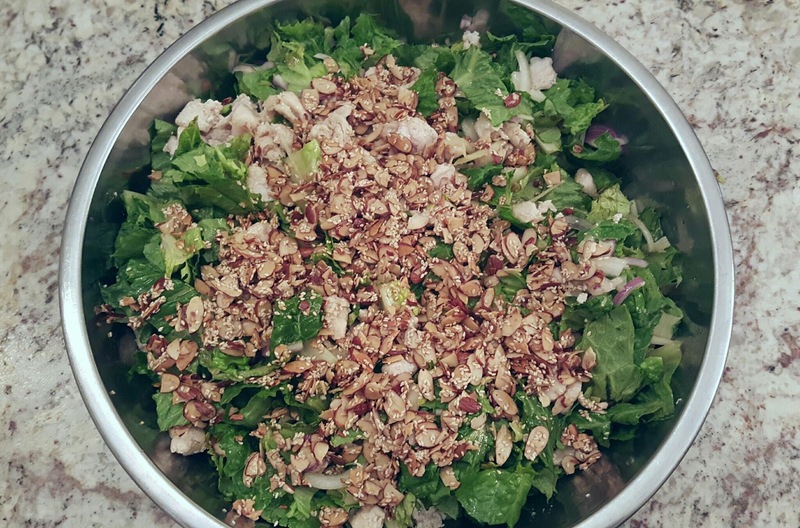 I add all the toppings to the salad, then add the dressing, and toss it all together well with a large spoon to get all the dressing mixed in next well. This is what it looks like before I toss it. We use this as a complete meal. Sometimes I do not add the chicken and use it as a side. It is always a huge hit whenever it is served, from potluck to special occasions. Just to let you know these are pictures of multiple recipes that I made for our family. Cup up the lettuce and wash with Basic H all natural cleaner. Thinly slice the onions add to lettuce. 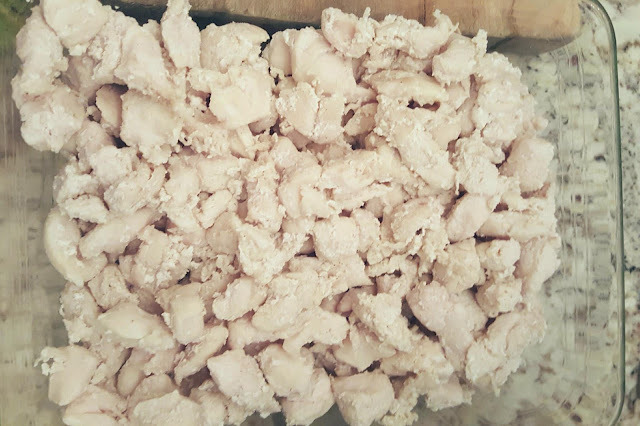 Cut up boneless chicken and cook, or cook chicken and remove from the bones. Let cool for a few minutes. Melt the butter in a pan and then add the almonds, stir and brown over medium heat. When golden brown add the sesame seeds and continue over medium heat until they are golden brown. Turn off and let cool for a few minutes. 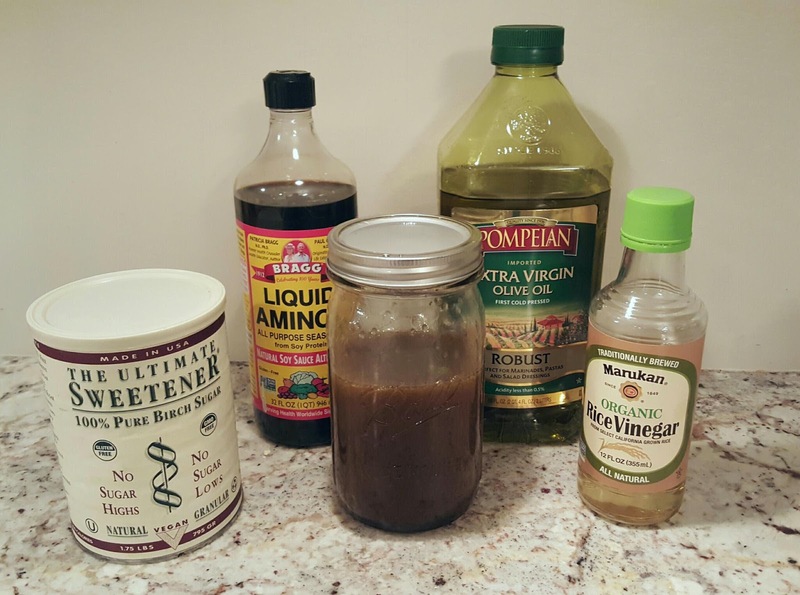 Mix all the Dressing ingredients together in a jar and shake well. To see more pictures and updates, you may want to follow us on Facebook and Instagram. 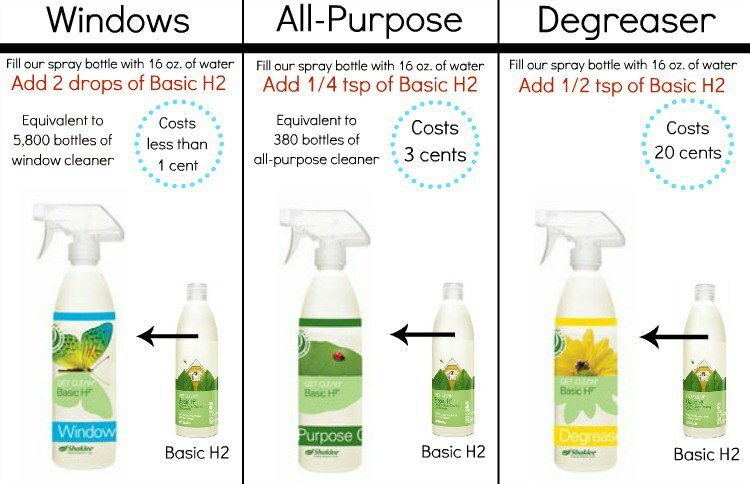 Doug and Sharon Heasley(Parents of a Dozen)To get your Basic H2, all natural cleaner click here!